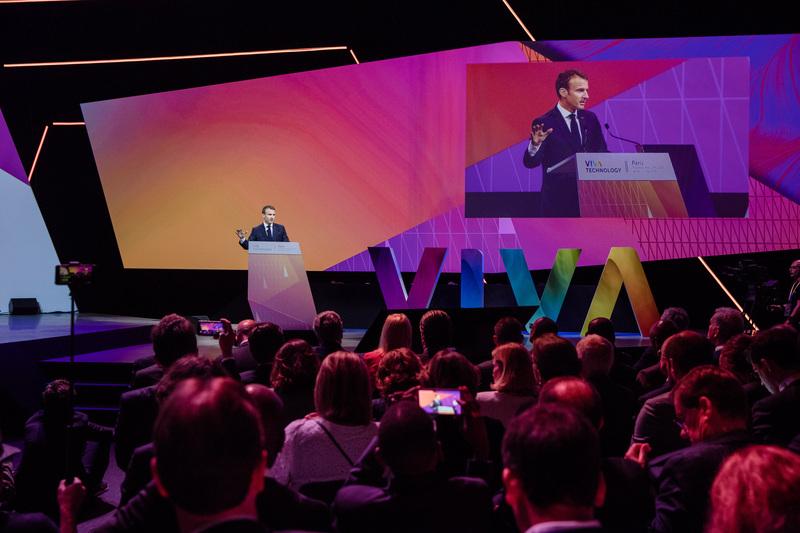 French President Emmanuel Macron gave a speech at VivaTech in Paris, alternating between French and English. He defended a third way to regulate tech companies, which is different from the U.S. and from China. Macron thinks Europe should have a say when it comes to regulation — and it shouldn’t be just about privacy. Of course, he defended GDPR and online privacy, but he also talked about taxes, cyberbullying, the protection of independent workers and more. Yesterday, Macron hosted 50 tech CEOs to talk about leveraging tech for the common good, especially when it comes to education, labor and diversity. Microsoft CEO Satya Nadella talked about the event before Macron took the stage. Macron first started with a few numbers on the French tech ecosystem. “I want to talk to the entire French ecosystem here today. What we’re all doing is essential for our country and the world,” he said. Based on his numbers, startups raised $2.9 billion in France last year (€2.5 billion). That’s three times as much as in 2015. He then listed some of the recent changes, from corporate taxes to France’s open data policy and the French Tech Visa. He didn’t have much to say about the tech industry in particular. You could feel that he has a lot on his plate right now and that tech is more or less an afterthought. “France is changing like crazy. And that’s why we can say that France is back,” he said in English to conclude the first part of his speech. “My second message is for Africa because you decided to invite Africa to VivaTech this year,” he said. Macron then defended France’s project to create a European tax on big tech companies. If the French Government can convince other European Governments, big tech companies would be taxed on local revenue in each European country. It could be a way to avoid tax optimization schemes. Smaller European countries with a lower corporate tax rate don’t seem convinced yet. Macron also criticized U.S. regulation on tech companies, saying that the U.S. Government is not doing enough when it comes to online harassment, taxes, labor and more. He then criticized the Chinese model, saying that the Chinese Government is not doing enough when it comes to privacy, human rights and gender equality. After yesterday’s commitments, the French Government is going to track tech companies every six months to see if they actually implement what they promised when it comes to tech for good. He also finished by saying that the Tech for Good Summit should become an annual initiative. Tech CEOs will be invited once again to the Élysée next year ahead of VivaTech.